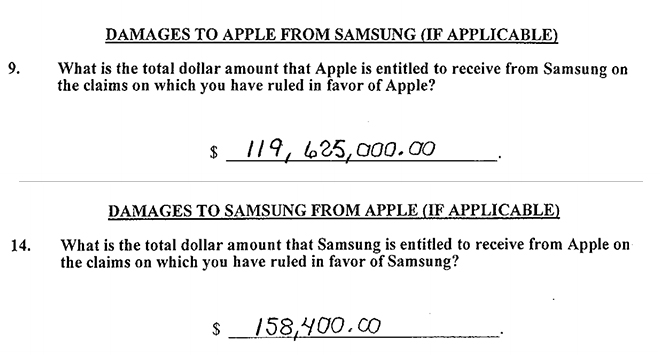 After being recalled to clarify an issue with Friday's verdict, the Apple v. Samsung jury on Monday modified the award amounts for various claims, but left Apple's share of damages unchanged at $119.6 million. With the determination handed in, reporters were able to speak with jurors in the case, including Foreman Thomas Dunham, who explained there was no single piece of evidence or expert testimony that ultimately swayed the jury, according to in-court reports from Re/Code. The initial verdict awarded Apple $119.6 million, though counsel discovered an issue with claims against Samsung's Galaxy S II. The jury found the device in infringement of certain Apple patents, but assigned no damages award to the handset. Following a two-hour session, the jury decided to award $4 million for the Galaxy S II, but modified payouts for other products, leaving the combined damages total at $119.6 million. Dunham, an former IBM executive, called the issue a "clerical error" in which incorrect figures were logged in a few boxes. Most substantial of the various additions and subtractions from the original verdict was a $4.6 million deduction of damages relating to the Galaxy S II Skyrocket, Samsung's AT&T version of the handset. The first verdict form, which was made public on Friday, showed a bulk of damages —some $99 million —came from Apple's '647 patent covering data detectors or so-called "quick links." As for Google's involvement in the case, both Dunham and another juror, Pamela Sage, said revelations regarding Internet giant's promise to pay for certain legal fees were "interesting." The facts did not sway the jury's final decision, however. During trial proceedings, it came out that Google was contractually obliged by Mobile Application Distribution Agreement (MADA) documents to pay for the defense of certain patents claims made against Samsung. In addition to the undisclosed figures, the company would also take on responsibility for those same patents if Samsung were to lose the trial. "It was interesting but it didn't change any of our thoughts," Sage said. "It didn't change our decision making in any way." Update: The U.S. District Court for the Northern District of California has made the final jury verdict form available for public viewing. A copy of the document is embedded below.